April showers, and showers, and showers..3 days of steady rain..
Hosta that the deer have already nibbled..drat! My little garden gnome is wondering how he will cross the "moat". 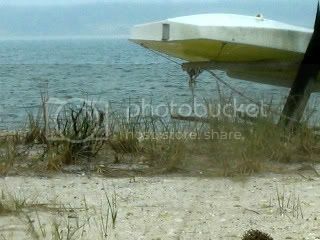 But things are getting green..
And down the street at the beach, a lone sailboat waits for clearer days.. In the distance you can see a hearty soul braving the weather.. Please visit Susan's blog to see the other Outdoor Wednesday blogs.. Thanks for visiting..see you for Tablescape Thursday, I hope! We had the same weather for 3 days and today is gorgeous. I love the shot of the boat on the beach and your burger looks wonderful. I had a patty melt for lunch today. Kathleen, hope your rain ends soon. I know that I definitely get tired of dreary, wet days even when we need the precipitation. The deer seemed to have enjoyed your hosta. Lunch looks tasty ... I would be happy just having the onion rings for lunch. They look delicious. Kathleen, I sent Noah on his way East......we had lots of rain last week. I am not sure if we are going to have a real spring or not, the temps go from 50's up into the mid 80's, the rest of the week in the 80's. 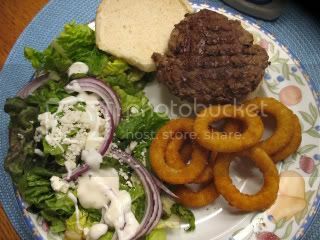 Your dinner looks delish, especially the onion rings. 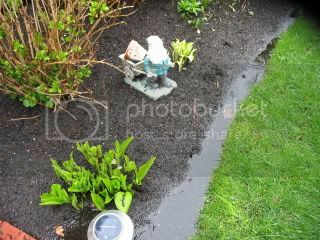 Kathleen, I hope it stops raining soon so the gnome can get across the moat...I heard they can't swim. I loved your peaks into the garden, do you see the deer in your yard or just the damage? The beach shots are peaceful looking and your dinner sounds wonderful. I hope you can join us for Thrifty Thursday tomorrow, you can just take more pictures of your wonderful chandy and tell us more how you got it. I'm co-hosting so it'll be at my blog. Hope to see you there! Love your header! Kathleen, I guess you'll be out gathering the animals two by two? LOL! I know how much you love the animals! Have no fear we'll be getting 80's and sun by the weekend. Your burgers look good. GMTA, only I pan-fried mine tonight! Since I haven't cooked since Sunday you burger on the Griddler looks like steak to me!! We're supposed to be getting rain for the weekend but I hope it is just a few sprinkles.. Didn't know gnomes couldn't swim ..lol Hope the deer don;t nibble too much before you can spray! Burger looks great. I almost did them tonight too but changed my mind. It is definitely greening up there at your place. Looks good from here. I got a kick out of your gnome. I have one with a little cart too..probably his cousin! It is great when it spring time...I love when things turn from golden brown to green. The earth comes alive with spring color. Something to be thankful for! Oh...that "summer" meal looks soooo good! Mmmm! I know what you mean about all the noise! I stay in NYC a few times a year...no matter where I stay I hear traffic! That's exactly why I'm NOT an International Jet-Setter...LOL! Enjoyed all of your pictures today,sorry I didn't get by yesterday. Thanks for stopping by and visiting my 2nd Time Around post. I love your photos of the beach and water. We try to get to the Jersey Shore every year. Kathleen, we had 3 straight days of rain too. Today was gorgeous and I'm sure it's headed your way. Dinner looks great! Do you ever think that you left a comment, then find out that you didn't? Good grief, I meant to tell you how much I liked your redone chandelier, It looks so lovely with the wisteria over your pretty table. I might have known, but forgot..
(there I go again) where do you live? I am seeing a fir tree and a beach. Anyway, before I drool anymore over the photo of the pierogi and cutlet meal, I am going to wish you a very lovely weekend. Just read the sweet note that you left on my "Sunday Favorites" post...so happy that you stopped by for a visit and thank you for your kind comments! Wow...you live in such a beautiful place!!! I lived near the ocean for nearly 30 yrs...now I'm near the mountains...hehe! What a change in scenery! 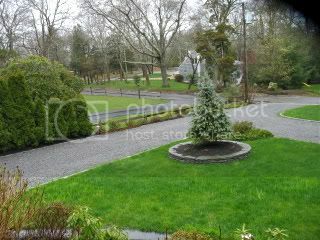 Your yard is so lush and green...guess all of that rain is working its magic!